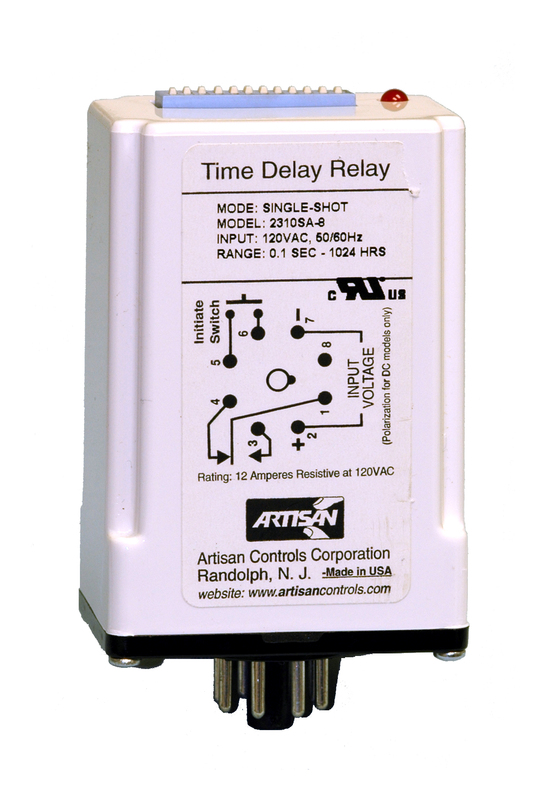 The 2310SA is an initiate switch controlled single-shot timer controlling a SPDT set of relay contacts. The 2310SA is available in a range of both AC and DC models. With operating voltage applied, the timer is in a stand-by mode. Momentary closure of the initiate switch causes the output contacts to energize for a preset timing period, and then de-energize. Re-closure of the initiate switch during a timing cycle will not effect the timing period. The 12 position DIP switches allow for selection of time range and time period. Output Relay SPDT contacts - 12A at 125V AC UL E88991 & CSA LR90143, 10A 125V AC TUV R9452021. Dielectric Strength 750V rms between open contact sets, 1,500V rms between contacts and operating voltage terminals.